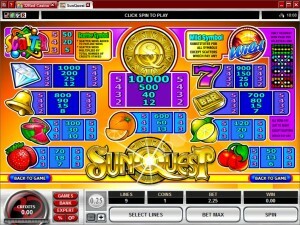 Sun Quest might sound like a slot machine which is themed around the Sun, and it is that to some extent, but for the most part you will notice that Microgaming used classic symbols here, especially various fruits like you would’ve seen in pub slots a couple of decades ago. The design is far from original and there aren’t that many paylines to work with, so it sounds like you’re not being offered much, but let’s see how the features are as well. This is a very simple slot, with two basic feature symbols (a wild and a scatter), with 9 paylines on the 5 reels and a jackpot of up to $20,000. 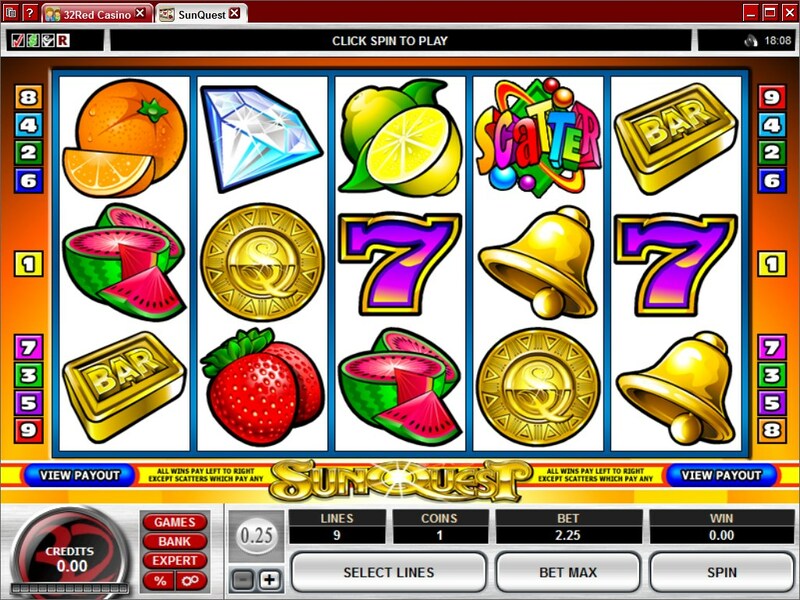 Now, while a lot of slot machines will not do that great design wise and will make up for that part with great features, Sun Quest is not that kind of game. You only get two features here, a wild and a scatter, and they’re as basic as they come. The first one, the wild symbol, is represented by the image of a sunset. It’s a very basic wild, which can appear on all the reels but which is not allowed to form combinations and award its own prizes. Instead, it is only used as a substitute for other symbols, so you can expect it to help you out by taking the place of the symbols needed in its place. The only symbol which the wild can’t replace is the scatter. As for the scatter symbol, it’s just as limited as the wild, but at least it is allowed to offer prizes. As you probably know, the name of the feature comes from its ability to appear in scattered locations. As long as you have at least three scatter symbols, you will receive a prize from the game, even if they’re not arranged on a payline. The smallest payout is at 5x the wager, offered for three scatters. Four scatters will get you 20x the bet as a prize. The maximum possible here is at 50x the bet, for five symbols. The prizes are disappointing, and you will find that most slots will give you 100x or more when you have all five on the reels. You get to use between 1 and 9 coins, and each one will activate a different payline. These coins are the ones you change if you want to vary the line bet, the range being in this case between $0.25 and $2. Max out the denomination and the bet will reach $18. The game’s biggest prize is decent enough, giving you a 10,000x multiplier for the line wager. That’s $20,000 for the jackpot, which is a decent prize for a $18 maximum bet. The design is about as impressive as the features, though I wouldn’t call it unpleasant. It’s simply a basic design, colorful and with lots of fruits among the symbols, with things like diamonds, golden bells or bar icons, all of them common for slots that have a classic inspiration. The Sun does inspire a number of symbols and the background graphics, with a fair amount of yellow and orange being used by the game. Symbols: Sunset (wild), Scatter Logo (scatter, 50x the bet), Sun Quest Coin (10,000x), Diamond (1,000x), Purple 7 (900x), Golden Bell (800x), Gold Bar (700x), Orange (600x), Melon (300x), Lemon (120x), Strawberry (70x) and Cherry (50x). Those that are moving from classic slots to modern ones will find that Sun Quest is in the middle ground, offering a minimum of features and few paylines, but also the 5 reels and the decent design that they might be looking for. 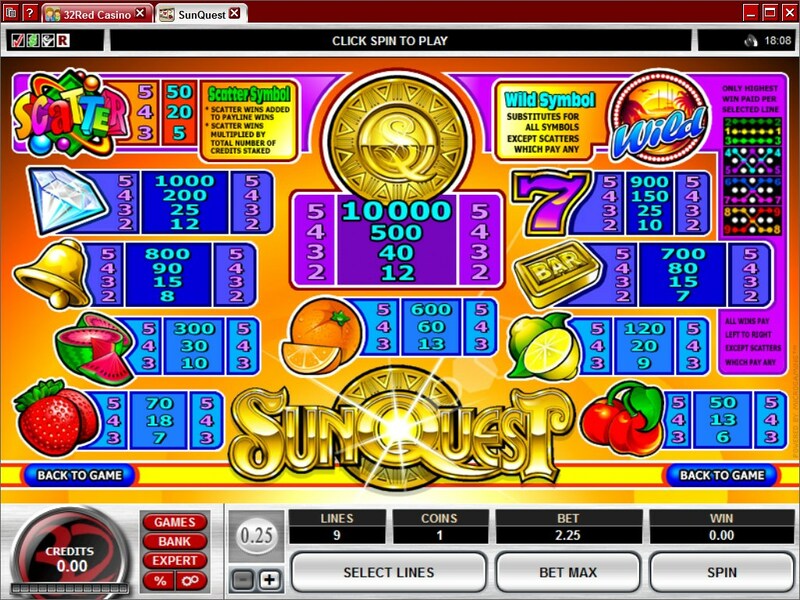 The Sun Quest slot machine is offered through the Microgaming platform, so if you want to play it for real or just to practice, look out for casinos that use it.